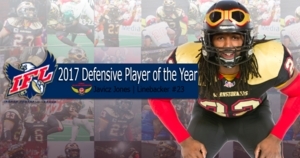 DES MOINES - Iowa Barnstormers linebacker Javicz Jones was named the Indoor Football League's 2017 Defensive Player of the Year, the League announced today. Jones (6'1, 230, Mary Hardin-Baylor) has been named the 2017 IFL Defensive Player of the Year. Jones was a force to be reckoned with all season long, finishing with 148 tackles, two sacks, 10 tackles for loss, two forced fumbles, three interceptions, four pass breakups, two touchdowns, and one blocked kick. Jones’ stellar play was a catalyst for the Barnstormers return to the playoffs for the first time since 2009. Serving as a team captain, Jones' leadership and strong defensive play helped the Barnstormers rebound from a 2-2 season start and win 11 consecutive games, the longest win streak in the IFL. The Iowa Barnstormers finished the 2017 season ranking second in the league in points allowed per game with 36.3. Iowa's defense, led by Jones, held teams to 30 points or less in eight total games in 2017. Jones' talent was recognized throughout the season, as he earned IFL Defensive Player of the Week honors twice, in weeks 4 and 8. At the conclusion of the season, Jones also earned league honors as First Team All-IFL Linebacker.